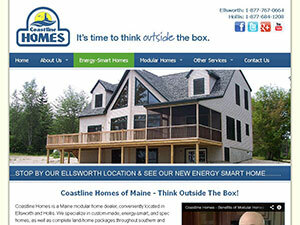 Find Coastline Homes in Ellsworth using Google Maps! Our Ellsworth location offers customers in Central and Down East Maine a full selection of Commodore Homes, Kent Homes, Pleasant Valley and Premier Builders with over 10 models on our lot for you to explore. Our normal business hours are Monday through Friday, 8:00am to 5:00pm and Saturday, 8:00am to 4:00pm. Available Sunday by appointment only.